In 2002, Graham apologized for the remarks, and Jewish community leaders accepted his apology — but the relationship would never again be the same. Rabbi A. James Rudin, the AJC’s senior interreligious adviser, wrote in a statement Wednesday that Graham regretted his remarks about Jews and Judaism. 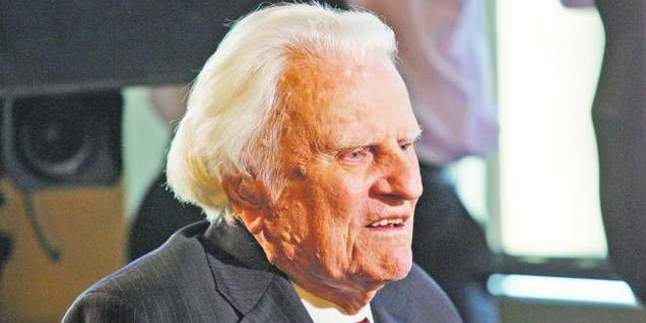 In all honesty (but I'm always honest, of course), I didn't know Billy Graham was still alive. It turns out he was 99, and died today at his home in North Carolina. He was known as the "Pastor to Presidents", and was there for every American President from Harry Truman through Barack Obama. One of the first televangelists, he was a Southern Baptist estimated to have preached to more humans than anyone in the history of Christianity. Through his "crusades" (400 of them in 185 countries), he's said to have persuaded over 3 million people to "accept JC as their personal lord and savior." What a waste of a life—preaching fiction and delusion to the masses. My sympathies go to his family and friends, but at least one of his sons is continuing the charade. UOJ, remember how some bloggers got outraged that Fifi Zahler of Baltimore and other folks could not have died at the hands of the corrupt Orthodox leadership? The police just could not be manipulated by mafia rabbis! Ok, now it seems that Baltimore police is one of the most corrupt in the country: POLICE CORRUPTION TRIAL OVER, BUT INVESTIGATORS KEEP DIGGING RABBINIC BALTIMORE LEADERS! As a frum Jew myself i actually wholeheartedly agree 100% with Graham's dislike of the liberal leftist America hating Jewish traitors,especially the swines of Hollywood,who share a large part of the blame in the moral destruction of our youth and our beloved America.